Barbara and I leave for South Africa in an hours time, for the Base Metals '13 conference in beautiful Mpumalanga, which starts on Monday. It will be interesting to see who will be there, as it was originally a 3-day conference, now reduced to one and a half days, due to only 23 papers being scheduled for presentation. Obviously the local industry is finding it difficult to send people to conferences at the moment, and I heard a couple of days ago that the Uranium Production 13 conference, scheduled for later in September, has now been cancelled. Internet permitting I will be updating daily while in South Africa, and also at the European Symposium on Comminution and Classification, in Germany, which I will be attending the week following Base Metals. Hope to see some of you in the next couple of weeks. 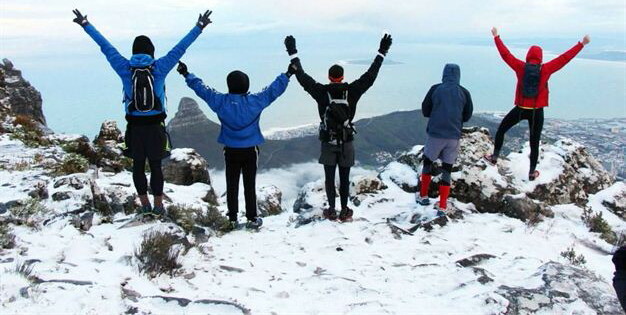 This photo has just been sent to me, of the view from the the top of Table Mountain this morning. Hopefully slightly better conditions in November for the scheduled hike after Flotation '13! Tim Henderson was a very popular student during his time at CSM. 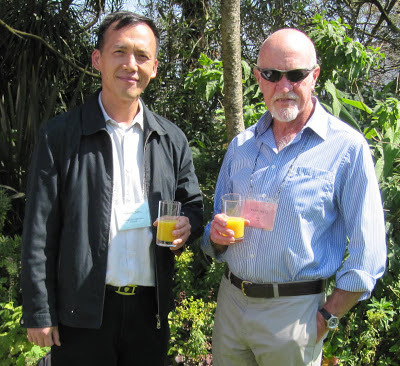 I last met him, and his wife Sue, at Solid-Liquid Separation ’04 in Cape Town, where he represented Mopani Copper Mines, Zambia. So it was great to hear that Tim has donated US$1.3 million (equivalent to £860,000) to the CSM Trust to enable its continued support for students and staff at the School, which is based on the University's Penryn Campus in Cornwall. Click here for the full story. Prof. Alban Lynch forecast recently that comminution would be the most important area for mineral processing this century, and this is certainly reflected in the interest being shown in next year’s Comminution’14 in Cape Town. Two new sponsors bring the total to a record 20, with Outotec sponsoring an MEI comminution conference for the first time, and Chinese manufacturer CITIC Heavy Industries also providing corporate support. Increasing use is being made of mixtures of thiol collectors in the flotation of platinum group and sulphide minerals. The use of mixtures is sometimes proposed to produce a synergistic effect, i.e., the flotation performance of the mixture is greater than the weighted sum of the individual contributing collectors. Some workers have reported a marked increase in galena recovery using mixtures of xanthate with either dithiophosphate or dithiocarbamate. However, when such observations are made, there is no clarity on the mechanism by which this synergy may occur. This is not surprising given the complex chemistry associated with even single collector-mineral surface interactions in a flotation environment. An interesting paper has just been published in Minerals Engineering. McFadzean et al of the University of Cape Town, tested pure galena and pyrite minerals. The findings showed that a higher galena recovery (92.2%) was obtained when using a 10:90 mixture of ethyl xanthate with diethyl dithiophosphate compared to 89.0% with the best single collector. Galena and pyrite minerals showed marked differences in their respective frothing effects and in their preferences for collector type, the best collectors for galena being the worst for pyrite This showed that most collector mixtures achieved greater recoveries than would be expected based on their additive performance alone. This synergistic behaviour was most notable for mixtures of strong and weak collectors. Antagonistic behaviour was noted for mixtures of two strong collectors. The results indicate that the collectors are mineral-specific and should have ramifications in the separation of different mineral types by using a collector that is specific to the mineral of interest. In addition it follows that, in the processing of complex ores, the use of collector mixtures should have a beneficial effect in targeting all of the various valuable minerals that are present in the ore. It was also found that the performance of a collector or collector mixture was most pronounced when looking at coarse particle recovery. Thus, good collectors showed good attachment efficiency with less detachment occurring in the high energy, turbulent batch flotation cell environment than for poor collectors, which showed poor recovery of coarse particles. Expect to hear much more of mixed collector flotation in future. McFadzean and O’Connor will propose mechanisms for their findings at Flotation ’13, and workers from Clariant in Germany will also propose a mechanism for how these synergistic interactions occur with sulphide minerals. A paper from China will discuss the use of mixed collectors for the selective flotation of antimony from a low-grade antimony-gold ore. Researchers from France will also discuss the effect of mixing anionic collectors (sodium oleate, hydroxamic acid, D2EHPA) with nonionic reagent on the selective separation of Ca-minerals. The Kelsey Mineral jig was mentioned in the posting on enhanced gravity separation on 19th August. 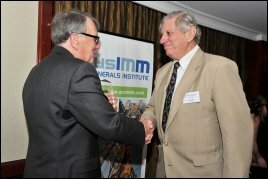 The inventor, Chris Kelsey, a mechanical engineer, was recently awarded The AusIMM’s Mineral Industry Technique Award. A full listing of the 2012 AusIMM Award winners can be found on MEI Online. Minerals Engineering now offers a new, free service called AudioSlides. These are brief, webcast-style presentations that are shown next to published articles on ScienceDirect. This format gives you the opportunity to explain your research in your own words and promote your work. Click the link above for more information and examples. Our first ever conference in Cape Town started 20 years ago today at the Cape Sun Hotel. 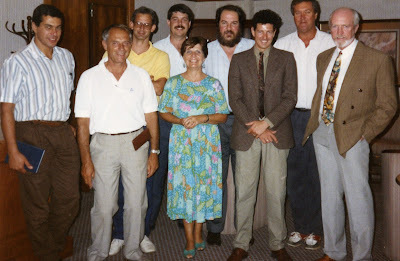 Minerals Engineering ’93 was organised in collaboration with the Universities of Cape Town and Stellenbosch, and the Western Cape Branch of the South African IMM and you may recognise a few familiar faces in the photo of the organising committee below. More details on the conference can be found on the posting of 27 October 2010. I called in at Truro a few days ago to see my old friends Nick and Felicity (Flee) Wilshaw, owners of Grinding Solutions Ltd (GSL), who are one of the sponsors of Comminution ’14. It’s always good to see a successful family run business, and Grinding Solutions was started by Nick and Flee in 2003 and now operates in all fields of mineral processing, offering technical, marketing and investment consultancy to the industry, as well as laboratory testing facilities. Nick was a fine rugby player, and mineral processing student at Camborne School of Mines, graduating in 1980 before gaining his MSc in Mineral Processing from Queen’s University, Canada. Their daughter Samantha Abraham, Office Manager, joined the business in 2012, having been an estate agent locally, bringing fresh ideas and renewed energy to the business. Felicity has been working full time with Nick since 2010 and bought with her years of experience as Business Support Director for Reflex Marine, a marine safety company owned by two other CSM graduates and based in Cornwall. Simon Bailey, Research and Development Minerals Processor, has been with GSL for the last four years and manages the laboratory in Tresillian, outside Truro and has a background in geology followed by an MSc in Mineral Processing at CSM. I was impressed with the laboratory, which has grown over the years, allowing GSL to carry out a large range of mineral processing techniques, becoming recognised throughout the industry as a leader in ultra-fine grinding. They have recently purchased a Malvern 3000 Particle Size Analyser to complement their existing fine grinding work and are the only South West company to have this equipment, enabling them to carry out the most up to date and accurate particle size analysis. Talking to Nick and Flee, it is evident that GSL is innovative in the way it deals with problems and has helped develop numerous processes from speculative ideas to large scale projects. Expect to hear much more of them in the future. It will be good to have them with us in Cape Town next April. Nick and Flee Wilshaw were also in Falmouth last night for the monthly sundowner, which is becoming ever more popular and well attended. Over 35 mining people were at the Chain Locker last night, enjoying the local ales and company on a very balmy summer evening. The next sundowner is on September 19th, so if you are in the area we would be very pleased to see you. Things are looking good for November, with registrations now coming in at a steady flow for the fine programme on offer. Already this week 15 delegates have registered from the University of Cape Town’s strong flotation group, and we thank them for their continued support of the MEI events. 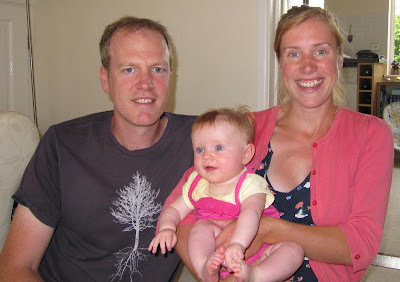 MEI’s Jon will miss out this year on the TableMountain hike, as he will be returning to Falmouth immediately after the conference to look after 5-month old daughter Josephine, with his Imperial College partner Dr. Kathryn Hadler. Few people will have failed to notice that metal prices have suffered this year, and in particular the gold and platinum sectors have been having a hard time. Although the prices have recovered a little over the past week or so, the South African industry has been hit very hard due to its ever increasing production costs. The gold mines are old, deep and low grade and the platinum industry has been hit by strikes, leading to demonstrations and many deaths. Because of this we made a decision to cancel next year's Precious Metals '14 and Nickel Processing '14 conferences in Cape Town. These have now been rescheduled, and Precious Metals '15 and Nickel Processing'15 will be held in Falmouth in May 2015. Prof. J-P Franzidis of University of Cape Town tells me that the "MinProc" conference held at the beginning of the month was very successful, with around 140 delegates, mostly students, as always, but a satisfying attendance given the state of the industry. Professor Stephen Simukanga, Vice-Chancellor of the University of Zambia and a former head of the Zambian School of Mines, gave a keynote presentation on the skills gap in the minerals industry in Zambia, and Marek Dworzanowski, President-elect of the Southern African Institute of Mining and Metallurgy, spoke on the role of metallurgy in enhancing beneficiation in the South African mining industry. Altogether, 37 long and 27 poster snapshot presentations were delivered in sessions on Comminution, Flotation, Bio/Hydrometallurgy and Sustainability. Another 18 posters were contributed to the poster session. Outotec awarded prizes for best presentations, but more of this in a later blog. One of the things that impressed me, Amanda and Jon at last year’s IMPC in New Delhi was the effort that the organising committee had made to bring as many students as possible to the Congress. Interviewed by AT Mineral Processing (issue 3, 2013) the President of the 26th IMPC, Dr. Pradip remarked “We have a large population of young minerals engineers in India... getting exposed to international level professionals from all over the world in such large numbers, perhaps for the first time. I think that listening to all these professional leaders should inspire at least a fraction of them to take up minerals engineering as a career. Even if 10% of them think about minerals engineering as a career of their choice it would be a great contribution to minerals engineers in India." I hope that future IMPCs heed this sound advice. A few months ago Stephen Grano made some interesting observations on froth flotation, and why it is still so intensively researched (posting of 11th April). He implied that journals may be publishing work similar to that carried out in the past, but now lost in the mists of time. Are we to some extent going round in circles? In the many comments on this posting Liza Forbes of CSIRO agreed that older pieces of research (especially those older than 30 years) are not known as they should be. She feels that many young researchers base the majority of their knowledge on more recent work, resulting in a progressively increasing lack of citations of older work. She suggested that senior researchers should invest more time with junior staff, to make sure that they are aware of the work that took place decades earlier and of its significance. She even suggested that Minerals Engineering might publish an annual special issue, where people nominate and discuss an old piece of work which they consider to be important, yet largely overlooked, thus reviving/highlighting some golden oldies. The device consists of a cone, working at a minimum 200 r.p.m. (and up to 400 or 600 r.p.m. to increase throughput) with the operating conditions being capable of adjustment to suit. The feed is introduced into the top of a rapidly rotating vertical cylinder, within which there is a set of vanes, rotating in the same direction but at a lower speed. The centrifugal action ‘beds’ the heavier particles against the inner cylindrical surface, while the relative action of the vanes creates a washing motion, to help carry away the lighter gangue. All heavies are trapped within the cone, by centrifugal force, while the waste passes out over the rim. It is said to take less than a minute to stop, clean and restart and will treat 2 tons per hour, at a claimed recovery of 98 to 99 %, with little power and water consumption. A description of an early Knelson or Falcon concentrator? No, this is an extract from the Mining Journal, of 28th June 1902, describing the Maurice centrifugal gold separator, which was in use at the time in France on gold-bearing sands! This technique was resurrected many years later, in a laboratory separator marketed by Magstream, while Richard Mozley introduced centrifugal separation to Cornwall on a plant scale, with his MGS separator in the 1980s. Outside of the county of Cornwall, other centrifugal separators such as the Knelson and Falcon concentrators for fine gold, and the Kelsey jig also made an appearance. When one compares the description and operating instructions for some of these devices, one is immediately struck by the similarity to the description of the Maurice separator of 1902. What do you think? Does the 1902 device highlight valid comments made by Stephen and Liza? Should we be trying to educate young researchers in the need to extend literature searches to way back in the mists of time? China’s Tsinghua University is one of the top Universities in the world, recently being ranked world number 31 by The Times Educational Supplement. This university, raised amid the Qing Dynasty's ruins in 1911, was initially financed by US-imposed indemnities after the 1900's Boxer Rebellion. Its professors are highly esteemed: 36 are members of the Chinese Academy of Sciences and 32 belong to the Academy of Engineering. Of its 28,000 students, 2,400 hail from overseas. So it is with great pleasure that we welcome Dr.Yuande Zhou, of Tsinghua University, who will represent China on the Editorial Board of Minerals Engineering. I met Dr. Zhou in June, when he made a very impressive presentation on coal-particle fragmentation efficiency in a roller pulveriser at Computational Modelling ’13. Dr. Zhou is an Associate Professor of Geotechnical Engineering. Prior to joining Tsinghua University in 2010, he worked as a Postdoc fellow at The University of Hong Kong, having earned his Bachelor and PhD degrees from Tsinghua University in 1999 and 2004, respectively. Dr. Zhou is interested in solving problems that involve damage and fracture of continuum, transport of heat, mass, and momentum, particle breakage and comminution, etc, using various computational methods such as finite element, meshless methods, and discrete element methods. His recent research effort is to use statistic approaches and multi-scale models to address the mobilization mechanism of fine coal particles in pulverisers. His research has been supported by the National Science Foundation of China and industry. 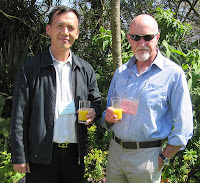 I look forward to working with Dr. Zhou, and to seeing him at many more MEI Conferences. In brief is a new thread to the blog which I hope will be a regular feature. Its success will be dependent on the inflow of news and photos from blog readers, so if you have any news of events etc, accompanied by photos, please send directly to me at bwills@min-eng.com. 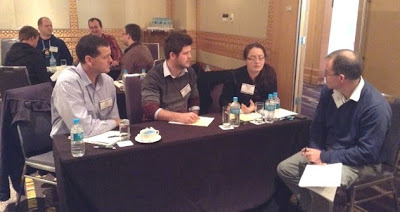 The JKTech’s Diana Drinkwater tells me that the Eco Efficient Comminution workshop, which was run immediately after Metplant ’13 in Perth, went very well, with 16 delegates divided pretty evenly between engineers, vendors and operators. Following on from a theme that emerged during the conference, one of the presenters, Ben Murphy, coined the term “flotatinution” and there was some interesting discussion in the workshop about different ways of designing flotation circuits to minimise comminution energy. On behalf of everyone in the industry we wish you both speedy and full recoveries. 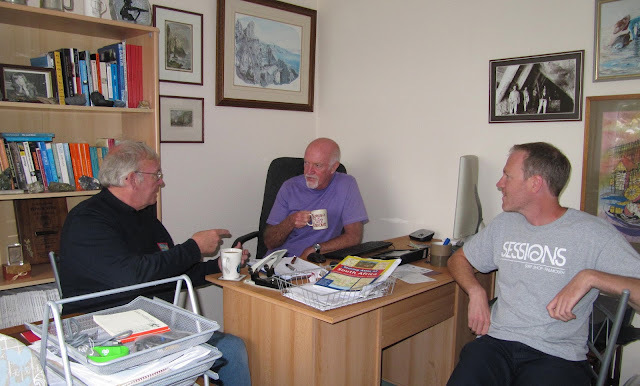 We moved premises a month ago, and testerday welcomed our first visitor, Tony Clarke, who will be well known to anyone who passed through Camborne School of Mines between 1973 and 1998, when he looked after the mineral processing laboratories and mill. He now researches the evolution of Cornish mineral dressing, and is an enthusiastic volunteer at the excellent King Edward Mine Museum. If you are ever in the area do call in and see us. We are only a couple of miles from Camborne School of Mines in Penryn. Our new address is 1 Freeman Collins Drive, Falmouth TR11 2GA. The blog has just recorded over 20,000 page views over the last 30 days, the highest ever. It is very satisfying to know that so many of you regularly visit the blog and, increasingly, contribute to it via your comments on the postings, which have lead to very stimulating discussions. Many thanks to you all. Your interest is greatly appreciated and provides all the incentive that I need to continue to provide updates on our great industry, and the people that drive it. I am always open to your ideas for potential discussions, and do send me photos of people and events if you feel that they would be of general interest.